Published by Hodder and Stoughton Limited, London. First published in 1960. Size: 210mm x 145mm. 192pp total. Including black and white photographs or line art illustrations for 67 fish species. Hardcover with colour dust jacket. Although written 56 years ago, The Queer and Rare Fishes of New Zealand is still an interesting read. Parrott lists and describes 67 fishes that he considers to be among the more unusual. They are unusual in the sense that they are not your typical fish shape. Just some of the fishes covered in the book include hagfish, lamprey, ghost shark, elephantfish, flying fish, sunfish, moonfish and clingfish, along with several species of flounder. Arthur Parrott was an old boy of Christ College, Christchurch. In 1928 he was appointed to the North Canterbury Acclimatization Society to investigate the food and growth rates of trout in Canterbury rivers and lakes. In 1930 he was appointed to the then newly formed New Zealand freshwater research committee. After service in the New Zealand army during the Second World War, he was appointed biologist to the Canterbury Museum, Christchurch, where he worked mainly on the classification and identification of New Zealand fishes and spiders. In 1948 he was appointed the curator of insects at the Cawthron Institute, Nelson, New Zealand. 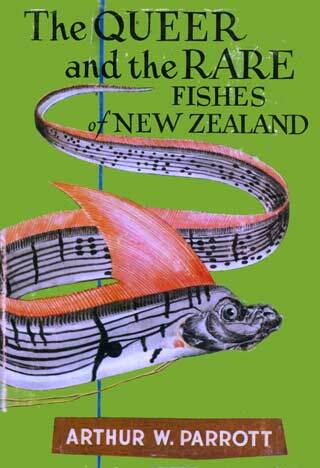 This work was published in 1960 just three years before A Treasury of New Zealand Fishes was first published by his New Zealand contemporary David H. Graham, who was a biologist appointed to the Portabello Fisheries Investigation Station, in Otago. Parrott makes mention of Graham’s work numerous times throughout the book. It is notable that research into New Zealand’s marine fishes dates back well into the 19th century. Considerable work by the likes of Parrott and Graham have done much to advance our understanding of this fascinating subject. It is a most enjoyable book for fishermen to take in a chapter or two before bedtime, or to use a reference should you wish to learn more about a species of fish you have caught, or would like to. From the dust jacket: “The purpose of this book, as of the author’s two previous books on New ­Zealand fishes, is to serve as a popular introduction and guide to the manifold varieties of our marine fishes, whose curious body shapes impress the casual observer, and deeply interest a more serious naturalist. Everyone is familiar with what may be called the most fish-like fishes – those that conform to a more or less orthodox body form. There are, however, numerous ” modifications of the body that are so odd and fantastic that it is difficult for the average person to conceive that such forms are really fishes, related to the more common and normal types that he sees in the fish market.